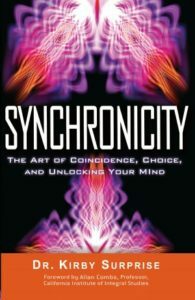 Interviews with psychologist and author and Dr. Kirby Surprise explores whether or not synchronicity is real. Alex Tsakiris: Is there ever a reality to a synchronistic event beyond my personal internal psychodrama interpretation of it? And that also bridges us into the other transformative realities of near-death experience or out-of-body experience or other transformative experiences, is there a parallel? Is there a reality to any of those? Dr. Kirby Surprise: Synchronistic events are objectively real. Absolutely 100% real. But they’re a mirror. So when I say that what you’re seeing is subjective, I’m not saying that these are parlor tricks the brain does on you. I’m saying that both your psychodynamic projections and the mirroring effect are real and they’re external. They are actually out there and you are actually changing the environment that you’re in by 3% to 6%. And the book is about a reasonable explanation, an expository fiction on how that’s possible. Now the easiest way to prove that people are the source of synchronistic events rather than another supernatural source is very simple. You create them yourself. Everybody does this all the time. This is not a specialty skill. Every single living human being is walking around in clouds of synchronistic events they themselves generate. Those events are changing the environment slightly to bring them the patterns they’re seeking. Now the sort of Flat Earth explanation to this is that we’re changing the environment. The reality is we’re moving through probabilities. String theory is telling us we’re sitting in a virtually infinite amount of alternatives right now. I’m saying that instead of people thinking that we’re jumping between universes we already span an infinite amount of these probabilities at once. We’re moving through them and we’re steering through them by what we’re thinking, feeling, and paying attention to. These things like out-of-body experiences and the more paranormal stuff I don’t look at as paranormal. I look at it as extremely normal. And I think that slowly the verifiable part of the science is gradually catching up to what our mystic, Shamanic, ancestors already knew. It’s all science. Metaphysics is physics. It’s an extension of it. The modern part of science is that there are some things we can verify and some things we take a best guess at. The thing about synchronicity being a mirror is it’s easy to verify, you know? You go out and create your own. Author Bill Pillow discusses Prenatal Psychology.